Want to make your Imagery more interactive and attractive? Design is the key takeaway from any website or company branding. The beauty of design is the appeal it has to the eye. Moreover, it is important that you have unique designs and logos to complement your business to help you stand out in the market. 38% of users will stop interacting with a website or a brand if the layout is unattractive so let us help you make your brand worth visiting and engaging with our beautifully thought and designed graphics. 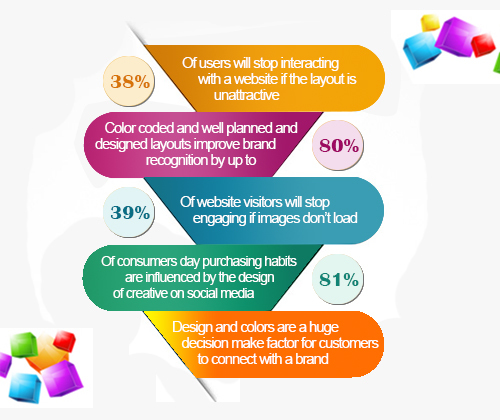 Colour coded and well planned and designed layouts improve brand recognition by up to 80%! Your logo will be spread across all of your business related transactions inclusive of letter heads, advertisments, brochures, website, etc. The importance of a unique logo for branding purposes cannot be stressed on enough. Your logo represents your business and it is important to make sure that is it unique and attractive and sets you apart from your counterparts. Your business cards play a huge role in how people perceive your brand even before visting your website or learning about your brand. When you hand out your business cards, you will want people to be intriguied by its design for which our team of innovative graphic designers and content writers are at your disposal! With so many people all over social media, it is a necessity to make sure that your social media is fresh and new in order to be attractive. Right from the graphics to the content, every detail has a part to play. Each post is curated to suit your requirements while being aesthetic yet engaging at the same time. Posters play a major role in advertising and it is imperative that they are attractive and have the right colour schemes and layouts as they have to be eye catching when someone walks by. It should spike consumer’s interest to find out more about your business and your product. Colours, layouts and content make up the better part of poster design. Similar to posters and business cards, brochures are phamplets with detailed information about your business or an event or product, thus you should tread carefully while designing a brochure. It should spike consumer’s interest to find out more about your business and your product. Colours, layouts and content make up the better part of brochure design. Be it design or content creation for any miscellaneous business material such as letterheads, certificates or invitations, we have got you covered. No matter how minor these miscellaneous material may appear, they play an important role in branding your business.